Google has renamed the Reports tab the Reporting and Tools tab in Google Adwords accounts. Within the reports section, Adwords users will find Reports, Change history, Conversions, Google Analytics and Website Optimizer. 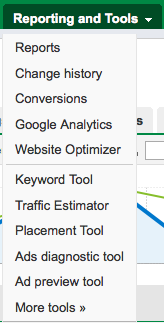 Within the tools section, advertisers will find the Keyword Tool, Traffic Estimator, Placement Tool, Ads diagnostic tool, the Ad preview tool and a link to more tools. Placing the account analysis and planning tools under one tab will make Adwords account management both more convenient and efficient. This entry was posted on October 12, 2010 at 8:10 am and is filed under Adwords Reports Tab Now Reporting and Tools. You can follow any responses to this entry through the RSS 2.0 feed. You can leave a response, or trackback from your own site.